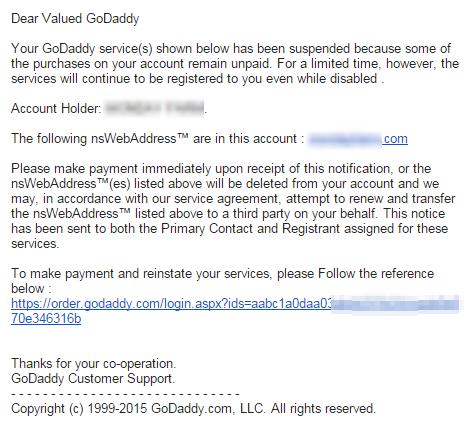 Your GoDaddy service(s) shown below has been suspended because some of the purchases on your account remain unpaid. For a limited time, however, the services will continue to be registered to you even while disabled . Please make payment immediately upon receipt of this notification, or the nsWebAddress™(es) listed above will be deleted from your account and we may, in accordance with our service agreement, attempt to renew and transfer the nsWebAddress™ listed above to a third party on your behalf. This notice has been sent to both the Primary Contact and Registrant assigned for these services. 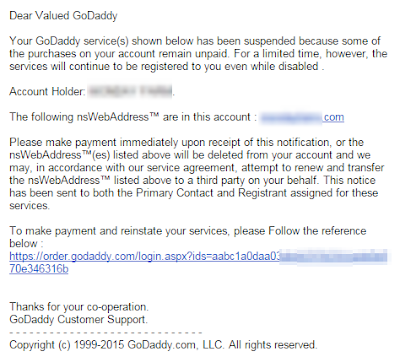 Copyright (c) 1999-2015 GoDaddy.com, LLC. All rights reserved.